Nicosia: A welcome dinner was organized by the Government of Cyprus in honor of foreign delegates from different parts of the World to attend the first Cyprus Cinema Summit at Nicosia. “We are gathered here to bring in new energy to Cyprus Film Industry. Your cooperation and support will help us to provide you the natural film studios of Cyprus. We wish you a very comfortable stay and a flourishing film business in Cyprus,” said Constantinos Yiorkadjis the Mayor of Nicosia welcoming the film makers. “We are here to serve you to our best. We want you to go back home with best of the experience so that you are again here with us for film business,” said Lefteris Eleftheriou Head of filming unit at Investment Cyprus and Chairman Plan Assessment Committee. 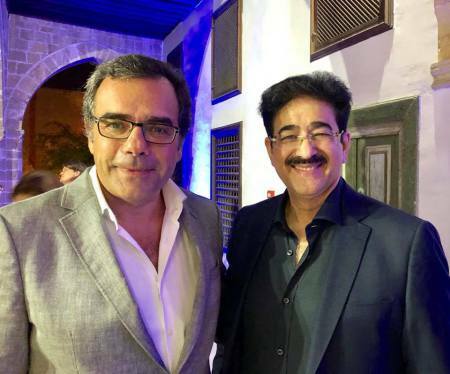 “We are overwhelmed by the hospitality and service given by the department and wish that Cyprus Film Summit a very successful beginning in cinema,” said Sandeep Marwah a special guest and Chair Indo Cyprus Film And Cultural Forum. Marwah also met Kiran Kumar Reddy, Komal Nahta, Sanjeev Singh, Ravi Bohra and Akshay K Singh from India. Ayman Sayed and Khaled Helmi from Egypt, Erika Laansalu from Estonia, Sarah Christie from Australia, Jolanda De Boer from Amsterdam, Martin Barab from Mexico, Crispin Wood and Fay Beck from UK, Christine Klaver from France, Elisa Sepulveda from Chile and many others.